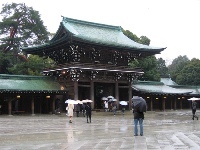 Close to the Harajuku Station, the Meiji Jingu is an easily accessible shrine and worthwhile stop for tourists in Tokyo. Built in homage to the Emperor Meiji and his wife, the Empress Shoken, this monument is located in a 175 acre (70ha) evergreen forest and consists of two main areas. In the inner Naien, there is a garden featuring shrine buildings and a treasure museum holding articles belonging to the Emperor and Empress. In the outer cloister, the Gaien, the Meiji Memorial Picture Gallery presents murals depicting significant events during the Meiji rule. It also consists of a sports arena, the National Stadium, and the Meiji Memorial Hall, which was an important political meeting place during the Meiji Era. Today, traditional Shinto weddings are held in the hall and newcomers to Japan are always intrigued when witnessing the unique Shinto wedding procession. The lush grounds are wonderful to explore early in the morning when they are peaceful and empty, and the gardens provide sanctuary from the busy city at any time of day. There is a lot to see and do in the complex, which can easily take a few hours to explore properly and should delight the whole family. Opening times: Daily from sunrise to sunset. Hours vary month to month.